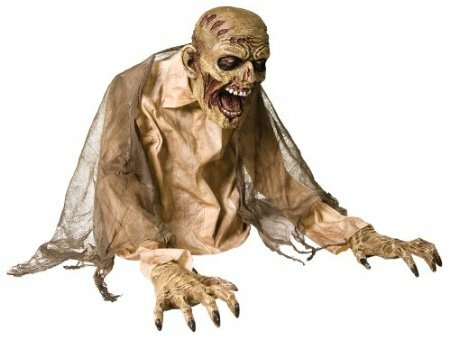 Standing 2ft tall, the Gaseous Zombie looks like he is pulling himself out of the ground – and then sprays the whole area with fog! Hard plastic frame is under his poly-fabric shirt and shroud with an attached 110 volt motor that turns his hand-painted plastic head with gaping mouth from side-to-side, and also comes with two creepy hand-painted plastic hands to complete the look. The 3ft long connector and hose attachment will fit on most standard 400w, 700w, and 1000w fog machines.